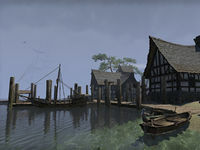 Northsalt Village is a harbor village located northwest of Northpoint, in northeastern Rivenspire. It serves as the docks for the nearby city. Wharfside Market — A general goods stall run by Grandeau Armene. This page was last modified on 29 March 2019, at 00:08.